In Eric Foner’s Gateway to Freedom, the Underground Railroad is a network of dignity and defiance. While reading the first half of Eric Foner’s Gateway to Freedom: The Hidden History of the Underground Railroad (Norton; $26.95), I flinched at the language used to describe the movement of fugitive slaves: Operatives “dispatch” the runaways from town to town and “forward” them to safe houses further north. It seemed to objectify the slaves (were they pieces of mail?) and to be at odds with the spirit of the book. But when I read the report by Joseph Ricketson Jr., an abolitionist in New Bedford, Massachusetts, to his New York accomplice, Sydney Howard Gay—“I received your valuable consignment of 200 pounds of humanity”—I realized that the underground railroad, a miracle of dignity and defiance, was also one of logistics. Neither the “highly organized system” of early abolitionist lore nor the “popular legend” of 1960s revisionism (which argued that blacks had received little help from whites), the underground railroad was, in Foner’s telling, “an interlocking series of local networks.” It was operated in a handful of cities—including New York, the focus of his narrative—by “a small, overburdened group of dedicated activists” and abetted by acts of everyday courage and fellow feeling. Founded by the free-born black abolitionist David Ruggles in 1835, New York’s Committee of Vigilance for the Protection of the People of Color was one of the few such groups that provided haven and succor to individuals on the run from their masters and the law—the Fugitive Slave Act of 1850 made it a crime to refuse to assist in a suspected runaway’s capture—and also committed itself to what Ruggles called “practical abolition,” or direct political action. 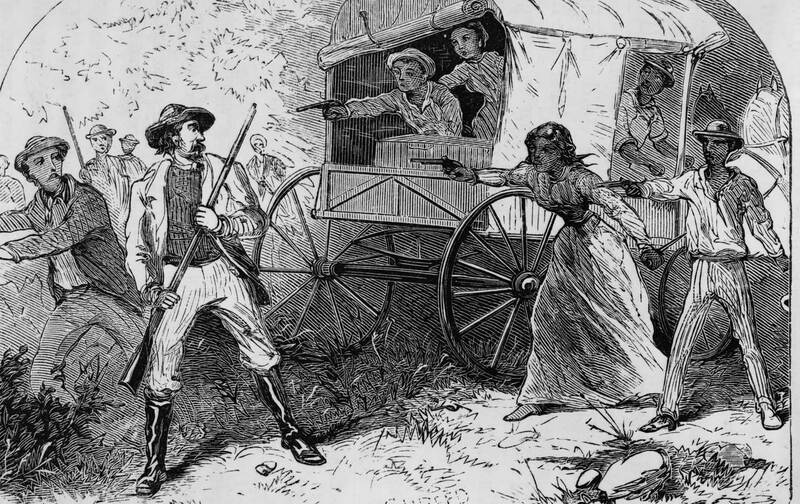 The activities of such networks from the 1830s through the 1850s helped transform the battle over slavery into the “irrepressible conflict” described in 1858 by William Seward, who even as US senator from New York hid runaway slaves in the basement of his Finger Lakes home. In 2007, one of Foner’s students discovered in the archives of Columbia University, where the author has taught since 1982, a “Record of Fugitives” kept by Gay, an editor. His office in New York, then a dangerously pro-Southern city, served as an important if precarious way station between the Upper South, where most of the runaways came from, and the North Country, a region of the state known for its religious revivalism and political radicalism, close to both Canada and freedom. Listing the names of more than 200 fugitive slaves who arrived in New York in 1855 and ‘56, the journal also records, in Foner’s description, their “motives for leaving” and “mode of escape.” Something very near an oral history avant la lettre, the document is used by Foner to piece together the “jigsaw puzzle” of the underground railroad in New York and the rest of the country. Foner, a member of The Nation’s editorial board since 1996, is too responsible a historian to place undue emphasis on his subject’s contemporary relevance; at most, he mildly suggests that “the underground railroad represents a moment in our history when black and white Americans worked together in a just cause.” But he is also sly in his use of details, as when he tells the story of Richard Riker, who served as the New York City recorder (a now-defunct municipal office) for most of the period from 1815 to 1838. Also a leader of what abolitionists called the “Kidnapping Club,” Riker partnered with a “pimp for slaveholders” and other malefactors to abduct free blacks and sell them into slavery. What Foner doesn’t explicitly mention is that he came from the same family whose name now adorns Rikers Island, the East River jail complex where men and women of color have been routinely and with impunity isolated, tortured, and killed—a fitting memorial, indeed. In a 2012 essay, George Scialabba suggested reconstituting the committees of correspondence that organized the American Revolution, hoping they “might help restore some substance to this society’s hollow democratic pretensions.” On the day I began reading Foner’s book, a week before the Greek elections, a representative of Syriza visited The Nation’s offices and spoke of the “solidarity networks” scattered across his country; Podemos, the ascendant Spanish party, has “circles.” But as a name for what is needed today, we could do worse than “vigilance committees”—and for a guide to how they worked at a time when nothing else would, we could do no better than Eric Foner. In Gateway to Freedom, he quotes an abolitionist editor describing fugitive slaves as “self-emancipated persons.” Foner plans to retire from teaching at the end of the next academic year, but his books will continue to be read as long as Americans, perilously free, journey north.